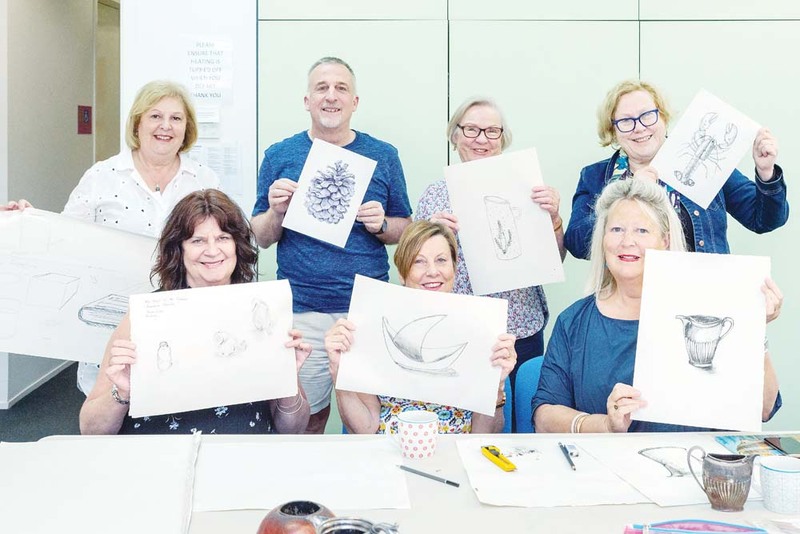 AN “enthusiastic amateur artist passionate about drawing” is giving those participating in Sorrento Community Centre’s drawing classes a welcome new perspective. Teacher Leigh Hullin said skill instruction at his “drop in and draw group” was tailored to the needs and wishes of participants, who are flourishing in the creative and supportive environment. Lessons focus on using line to create two-dimensional shapes and three-dimensional forms, on using shading and tone to establish realistic forms, on understanding and using principles of perspective, and, understanding common rules for composition, he said. Mr Hullin said what began as a trial class in Term 1 has run all year and is expected to continue next year, 1-3pm, Tuesdays, in the art studio room. Members use a wide range of materials, including graphite and charcoal pencils, charcoal, coloured pencil, watercolour pencil, crayon, oil pastels, chalk pastels, as well as pen and ink. “Each class member has a preferred medium and they work on their own projects with coaching and support,” he said. Mr Hullin said participants came from a variety of backgrounds and art-and-drawing experiences, yet find fun and commonality. “They are incredibly supportive of each other and generous with sharing materials, resources and ideas,” he said. The group recently visited the Mornington Peninsula Regional Gallery’s National Works on Paper exhibition “which we all considered to be outstanding”, said Mr Hullin, a retired child and family psychologist and former teacher. “Since retiring in 2014 and moving to Rye I have pursued creative outlets which I had little time for when working full-time,” he said. He says visits Portsea artist Jos Law who runs painting workshops from her own studio. “I developed the curriculum for the drawing workshop in conjunction with Jos in a way that would complement the two classes,” he said. “The art studio at Sorrento is well designed and equipped and I would hope that we can expand its use in the coming year. “Running the drawing workshop has been gratifying for me, not only in seeing each member’s skills and confidence develop but also in seeing the group develop socially and with friendship. Participants pay per class which allows flexibility and balance with other commitments. The core group of regular members are said to “very much miss the class during holiday breaks”.